CHOOSE YOUR SHIPPING OPTION BELOW CAREFULLY! CHOOSING THE WRONG OPTION MEANS THAT YOUR ORDER WON’T BE SENT TO YOU. Prisoner Cell Block H took the world by storm. Running from 1979 to 1986, ‘Prisoner’, as it was known in its home country, remains one of the most iconic and talked-about television serials to come from Australia, spanning a wonderful 692 episodes: each of them action packed, filled with gritty, intense storylines, some of the most wonderful characters ever created for TV soap, brought to life by a unique mainly female dominated cast whose portrayal of the ‘old lags’ are now nothing short of legendary. 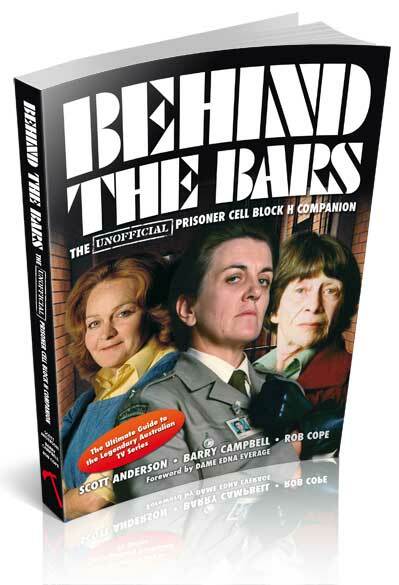 In this brand new book, Prisoner Cell Block H is remembered and celebrated by three people well known to the show’s fans – uniting current fan club founders Scott Anderson and Barry Campbell with Rob Cope, this book features new and exclusive contributions from the show’s cast, writers and crew. Behind the Bars – the Prisoner Cell Block H Companion also takes a look at the theatre productions, hit theme song and worldwide fan following that have continued to make Prisoner one of the most celebrated television serials of all time. Packed with never before published photos, this is one book that will be a must for any fan of the show! And if you’re not a fan of the show, this book will tell you why Prisoner Cell Block H has become THE cult TV series! Behind The Bars – The Prisoner Cell Block H Companion is the ultimate guide to this incredible TV series.